A radar level gauge for measuring the level of a surface of a product stored in a tank by use of a radar, where said radar transmits microwaves towards said surface and receives microwaves reflected by said surface and wherein said radar is adapted to transmit and receive said microwaves within two widely separated frequency bands. 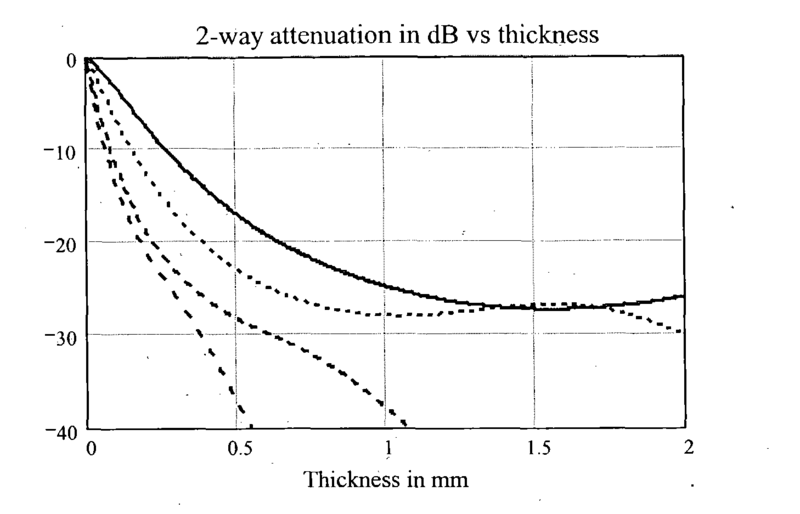 Widely separated frequency bands are chosen to utilize the differences in attenuation due to foam on the surface and the differences in beam-width or other disturbances. The ratio between the center frequencies of the two widely separated frequency bands can be quantified as at least greater than 1.5:1 or preferably greater than 2:1. One important part of the system of the present invention is a logic decision procedure. The signals received from the different frequency bands are compared and also stored over a certain time to make a good estimation of the information. When for instance two frequency bands are used, the higher frequency band typically will be more affected (decreased in amplitude) by foam on the surface and dirt on the antenna, while the echo in the lower frequency band might be less clean (more background noise) as the wider antenna lobe is more likely to pick up echoes from disturbing objects. For both (or more) frequency bands used in the present invention an echo spectrum is created and a number of suspected echoes are created as memory cells where echo amplitude, echo amplitude variation, calculated distance and an estimated surface velocity are stored. The echo amplitude variation is a typical characteristic for a turbulent surface and so is a possible surface level velocity (equal to a persisting change of the distance to the surface). Depending on the conditions in the tank these parameters are different and the logic process in the unit will come to different conclusions. The echo spectrum is converted to a number of logic variables from which it is deduced which of the frequency bands that are likely to give the best measured level value or if a weighted average of two or more frequency bands will give the most reliable level value. Within each frequency band the same function as in the classical frequency agility process can be performed but much more important is the possibility created by the present invention to avoid signals with very low amplitude if a high frequency radar level gauge should be used under foamy conditions or to avoid disturbances from tank structures when non foamy liquids with low reflectivity are measured. An application of a radar level gauge is shown in FIG. 1. A tank  1 is used for storing a product 2. The product may be such as oil, refined products, chemicals and liquid gas, or may be a material in powder form. A radar 3 is attached to the roof 4 of the tank 1. A microwave beam is transmitted from the radar via an antenna 5 at the interior of the tank. The transmitted beam is reflected from the surface 6 of the product and is received by the antenna 5. By means of a comparison and evaluating of the time lap between transmitted and reflected beam in a measuring and controlling unit, a determination of the level of the product surface 6 in a known manner is performed. The microwave may be transmitted from the antenna as a free radiated beam or via a wave guide (not shown), which communicates with the product. The radar level gauge as shown in FIG. 1 is only used as an example. According to the invention a level gauge operating on a mutliple of frequency bands is disclosed. An example of a radar level gauge ( 10) according to the invention is schematically illustrated in FIG. 2. The level gauge of FIG. 2 is composed by building blocks, which will be described below. A control unit  11 is controlling an RF module 12. Said control unit 11 is thus controlling the switching between the different frequencies on which the RF module may operate. The RF module  12 is generating the microwave signal for transmitting and receiving the microwaves into and from the tank as described. The signal received is transformed to a low frequency signal, which is digitalized and analyzed in a signal-analyzing unit 13. In the signal analyzer 13 the received signal is analyzed on the frequencies of which the level gauge is transmitting. From the analysis it is then decided in the signal analyzer on which frequencies the level gauge will be operated. A control signal with information about the chosen frequency is sent from the signal analyzer 13 to the control unit 11, which controls the frequency switching of the RF module 12. In the signal analyzer 13 there is also an evaluation unit, for calculation of the product surface level 6 in a conventional way. The different echo spectra received from the at least two different frequency bands are analysed in this evaluation unit for determining the level of the surface in the tank and for being the basis of the analysis of which calculated value being the most accurate as described above. Upon this analysis the evaluation unit will adopt the level gauging system to use only one of the frequency bands for determining the accurate value or to use the values from the at least two different frequency bands by use of any averaging calculation method. The distribution of the microwave signal between the RF module  12 and the antenna 5 is accomplished by means of a transmission line 14. Said transmission line can be provided by means of a coaxial wire or by any type of a wave guide. Coaxial lines, microstrip lines, striplines or other TEM-lines inherently have wideband functionality and can be used, but depending on the type of antenna some transition unit may be required. Particularly appropriate for use as a wave guide is a ridge wave guide, as such a wave guide has the bandwidth that is necessary in this application. A conventional ridge wave guide cannot be used without structural changes as it must be sealed for use in a tank. Hence, in this embodiment the ridge wave guide is adapted to level gauging requirements by sealing the wave guide to withstand pressure and temperature differences between the inside and the outside of a tank wall. Further, the surfaces of the ridge wave guide inside the tank wall can be provided with surface layers, which can stand possible contamination and influence from chemicals. One preferred surface layer is polished PTFE, which is difficult to wet. As the antenna  5, any broadband antenna for microwaves may be used but many conventional wide band type antennas are not suited for use in the tough tank environment with its requirement for sealing, problems with dirt etc. The antenna must be mounted via a feed-through in the tank wall. Wide band horn antennas may be used in any of different designs, either as normal probe fed horns or, as mentioned, as so called ridge wave guides, which have extremely large bandwidth. A ridge wave-guide can further be arranged for working in both one and two polarizations. Such a horn can be connected to the RF module 12 via a connection for the ridge wave guide in the RF module. This is an advantage as a good seal for the tank can be provided inside the wave guide. An explosion tight cladding may further be provided for in the casing for the electronics. Another alternative is to connect the horn antenna to the RF module via a micro strip feeder or any type of TEM-line corresponding to a coaxial line (TEM is a common name for all cables with two or more leaders irrespective of the cross-section of the cable). The antenna is a typical and very critical component in a multiband radar level gauging system. Beside of the normal antenna function (as described in antenna textbooks) it must fulfill all the following three requirements pressure sealing, sealing surface to withstand a layer of dirt, condensation etc and be usable over the two or more bands, typical in the present described system. As an example of a typical antenna for this purpose, a ridge horn antenna  41 which (as compared to its standard counterpart) is filled and sealed with a dielectric sealing 42 such as PTFE and shaped towards the tank atmosphere to avoid destructive condensation, i.e. as a basically conical shape which is polished. This horn can be made for linear polarization, i.e. with one or two ridges 43 (FIG. 4b) or for two linear polarizations, 4 ridges 43 as shown in FIG. 4c, in order to create circular polarization, a known technique to improve sensitivity in radar level gauges. The antenna can further be protected by means of a dielectric cover 44 across the opening of the horn (FIG. 4d). The space covered by the cover 44 is preferably, at least partly, filled with a dielectric foam plastic material 45. Another type of antennas that can be used for the purpose are helix antennas as these antennas are frequency independent or at least inherently of wideband (multi-octave) type. Helix antennas can be provided in plane or conical designs. For these antennas, connection to the RF-module  12 is preferably made by means of a coaxial wire. If a helix antenna is used for the level guide in the present invention, in this embodiment, it will be protected and built into a dielectric to make the antenna to withstand dirt. Still one more type of antennas that can be used for the purpose are patch array antennas for multiple bands. An antenna of this type can be designed in such a way that two frequency bands with two different center frequencies may be achieved, for instance by use of dual patches. An example of such an antenna is illustrated in FIG. 6, where reference number  50 denotes the antenna having a number of patch antenna elements 54 according to technique known in the art. Each patch element has a tuning stub 53 and feedpoint coaxial attachments 51. The patch elements, further, have shorting pins 52 connecting the patch elements 54 to an earth plane of the antenna. By use of a patch antenna 50 according to the shown example it is possible to arrive at a very broadband antenna for use in connection with the invention. A pulsed radar may be realized for achieving a corresponding function by substituting the VCO and the Phase Locked Loop (PLL)  23 with an oscillator with a fixed frequency and pulse circuit. the center frequency of the second frequency band is at least 1.5 times the center frequency of the first frequency band. 2. A level gauge according to claim 1, wherein the center frequency of the second frequency band is at least 2 times the center frequency of the first frequency band. 3. A level gauge according to claim 1 or 2, wherein said radar is coupled to a multiband antenna for transmitting and receiving said waves on said first and said second frequency band and the antenna having a seal at a feed-through in a wall of said tank, wherein said seal is made to withstand temperature and pressure differences between the interior and the exterior of the tank and to resist chemical affects by products in the tank. 4. A level gauge according to claim 1 or 2, wherein said radar is coupled to a broadband antenna covering the used frequencies for transmitting and receiving said waves on said first and said second frequency band and the antenna having a seal feed-through in a wall of said tank, wherein said seal is made to withstand temperature and pressure differences between the interior and the exterior of the tank and to resist chemical affects by products in the tank. 5. A level gauge according to claim 3, wherein said antenna (4) is one from the group consisting of: a horn antenna, a helix antenna, a patch array multiband antenna, a reflector antenna, a log-periodic antenna. 6. A level gauge according to claim 4, wherein said antenna (4) is one from the group consisting of: a horn antenna, a helix antenna, a patch array multiband antenna, a reflector antenna. 8. A level gauge according to claim 1 or 2, wherein said radar is a radar operating on a broad band covering the predetermined frequency bands and provided with selecting means for the choice of frequency band and wherein said gauge includes a switching function to allow the radar to be switched to operate on any of said chosen frequency bands in an automatic manner. 9. A level gauge according to claim 3 or 4, wherein the radar of the level gauge includes an RF module (12) for generating and receiving said microwaves. 10. A level gauge according to claim 6, wherein said gauge (10) includes a control unit (11) and a signal analyzing unit (13). 11. A level gauge according to claim 10, wherein said signal analyzing unit (13) in dependence of a performed analysis of the received microwave signal spectrum is set to determine on which frequency band the RF module (12) shall operate. 12. A level gauge according to claim 11, wherein said control unit (11) by means of a control signal from said signal analyzing unit (13) switches the RF module (12) to operate on a predetermined microwave frequency band. 13. A level gauge according to claim 9, wherein said microwave signal is transmitted from the RF module (12) to the antenna (4) by means of a transmission line (14) consisting of any one from the group of: a coaxial wire, a TEM-line, a microstrip line, a stripline, a twin line. 14. A level gauge according to claim 9, wherein said microwave signal is transmitted from the RF module (12) to the antenna (4) by means of a transmitting line (14) consisting of a wideband or multiband wave guide. 15. A level gauge according to claim 14, wherein said wave guide is a ridge wave guide. 16. A level gauge according to claim 15, wherein said ridge wave guide has a circular or a rectangular or an elliptical cross section. 17. A level gauge according to claim 16, wherein said ridge wave guide is at least partly filled with a dielectric material for sealing or that it is provided with a dielectric cover across any cross section of its horn. 18. A level gauge according to claim 15, wherein said wave guide is provided with one, two or four ridges (43) in order to transmit microwave signals in one or two or circular polarization. 19. A level gauge according to claim 3 or 4, wherein the sealing of said antenna is a dielectric serving as a sealing between the interior of the tank (1) and the surroundings. 20. A level gauge according to any of the preceding claims, wherein the first frequency band has a center frequency having a high penetration in an atmosphere prevailing above the surface of the tank (1). 21. A level gauge according to any of the preceding claims, wherein the second frequency band has a center frequency of a microwave having a narrow beam. evaluating the level based on the time lapsed between the corresponding transmitted and received microwave signals. in dependence of the analysis performed on the microwave spectra automatically setting the radar to work on only one of said frequency bands for determining the level based on the level calculation performed for the frequency band to which the radar is set. in dependence of the analysis performed on the microwave spectra automatically setting the radar to work on all of said frequency bands for determining the level based on an average of the calculation of the level performed for each of said frequency bands. FI75228C (en) 1988-05-09 An apparatus Foer moisture content of a maetning.